The August issue of Growing for Market magazine is out! 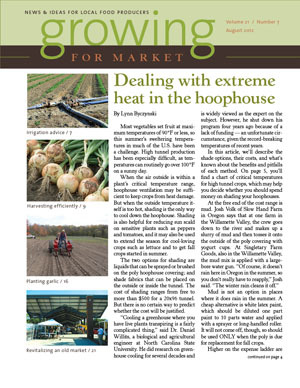 In it on page 9, you’ll find my article on how to harvest efficiently, mostly without machinery. Trade secrets are revealed – like when is a cabbage fully mature, and just what is “full slip” for a melon. And which crops should you harvest later in the shift, when the dew has dried from the leaves. I cover organization, planning and management, finding good crop sequences (don’t leave the corn languishing in the heat while you get the beans! ), tools, and various harvesting methods such as cutting whole heads, picking individual leaves, and “buzz-cutting” so the plant can regrow. And that’s just the leafy greens. There’s also the roots, including onions, and fruits (botanically speaking) such as tomatoes, peppers, squash, cucumbers and podded crops like beans and peas. Food safety, field washing and short-term storage until the happy diners get their hands on the food – all this is covered too. When you grow 60 different crops, how do you make time to harvest them all? Well, of course, not everything is ready to harvest at once, even in August. Some crops we pick every day, some every other day, some twice a week. Here’s a trick we use: For the every-other-day crops we have developed an ingenious phonetic system. On Monday, Wednesday and Friday we harvest crops beginning with a k/c/g sound; on Tuesday, Thursday and Saturday we harvest b and p crops. This works almost perfectly, with just a few crops we force into place: eggPlant not eGGplant! sPinach, senPosai! This system works well for us, and adds some amusement. It also ensures we harvest some cooking greens each day: kale, collards, cabbage some days, broccoli, pak choy, spinach on the other days. Beans take over from peas as the spring heats up. Corn gets picked on the days we don’t pick labor-intensive beans. Our main tools are Garden Way type carts, 5 gallon buckets and knives. Although special harvest knives can be bought, and we have some of those, we get most of our knives at yard sales and thrift stores. Great value for the money! Serrated bread knives can be excellent tools for cutting cabbage and kohlrabi, anything with a thick stem. My next few articles will be about dealing with nature’s surprises, being ready for anything, predicting what’s about to happen next, and deciding when to change plans and grow something different. Climate change is here, and we growers will need to adapt. Previous Previous post: Peak Watermelon Day?